This game requires a Kinect™ Sensor. Download the manual for this game by locating the game on http://marketplace.xbox.com and selecting “See Game Manual". 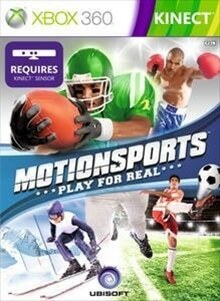 Kinect with 6 Exciting Sports- Football, Skiing, Soccer, Hang Gliding, Horseback Riding & Boxing! Race down the slopes of a Super G slalom, score a mind-blowing penalty kick, duck-and-run your way to a game-winning touchdown or throw punches at the champ as you test your skills in over 40 awesome sports challenges. Motion Sports live in game show will follow your hits…….. and misses, as you compete to go from local hero to a global sports phenomenon.